The best sporting estates in the country are brought together in our list. From West country hunting to Yorkshire shooting and Scottish salmon on the fly, Rupert Bates picks the best. Which makes it on to your wish list? A sporting estate is on the top of most people’s wish list. Tradition dictated that once a pile had been made in the city you would retire to a pile of matching substance with all the right accompaniments. And today, an estate with a spot of fishing, a lawn meet and a decent shoot remain the sporting Holy Trinity. But as those who have tried to find the perfect sporting estate know, such elysian fields are much sought after. If the ideal estate if proving elusive at the moment, cast your eye over our list of the top 50. There is something for everyone; grouse shooting on Gunnerside, hunting in the West Country and sporting birds in the Home Counties. The breadth of the country is covered in this definitive list, as Rupert Bates picks the very best. And if you have a sporting estate that makes the grade then let us know. A shimmering Highland estate and a lead role in the BBC’s Monarch of the Glen might attract uninvited visitors but they can’t reach you on the other side of Loch Laggan and the midges are mighty effective bouncers. Fishing on the loch and stalking across 45,000 acres of deer forests. The Baronial-style house sits on a promontory overlooking King Fergus’s Island. Queen Victoria liked it. Ashcombe’s 1,100 unspoilt acres across chalk valleys with steep contours present high, testing partridges and pheasants as part of an outstanding, well-managed shoot. There is a lovely Georgian house and an orangery for lunches. Guy Ritchie, Madonna’s ex-husband, has plans which include bringing back the vegetable gardens, lock, stock and two smoking beetroots. A beautiful divorce settlement. The Scottish home of the Royal Family beneath Lochnagar in Royal Deeside, with the granite castle and its sporting lands not expected on the market any time soon. Heather-clad hills, ancient Caledonian woodland and the River Dee weave over 50,000 acres. There is grouse-shooting at Corgarff and stalking in the forests. Balmoral chatters with the noise of silence, with the water running from the burns. Like a bit of everything? This estate, on the edge of the Dales, has trout fishing, wildfowling, a pheasant-shoot and a productive two-day grouse moor. Throw in English partridges, duck- and goose-flighting, roe-stalking and a Grade 11* listed house. Listen to the singing; proof that moorland well managed for red grouse can produce an infinite variety of birds. Bleasdale Tower sits in the head of a lovely bowl, with a stunning view south. The house, not too big, is ideal for a shoot party. “The shoot has some spectacular drives off the moor edge and can show pheasants and partridges that are ridiculously high,” says Frank Speir of Prime Purchase. There is a grouse moor of 6,000-plus acres, too, with a lot of work done on upland management to regenerate the moorland. 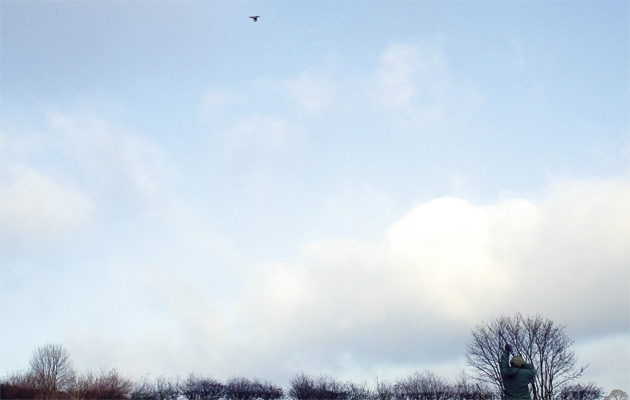 High pheasants and partridges fly over the roof of the Cotswolds. Steep valleys and woods are the ingredients for a shoot transformed by the Larthe family over the past 25 years. The mellow stone house has had a refurbishment, too. The property gets a mention in the Domesday Book but with no explanation as to how one of its drives came to be called The Fat Controller, although the sausage rolls are legendary. History in every Hampshire pore. Once the seat of Earl Mountbatten of Burma, now home to Lord Brabourne. Fly fishermen ask to be baptised in the Test, such is its nobility among chalkstreams, with brown and sea-trout and salmon, while a wild shoot promises snipe and duck. Royalty and statesmen decorate the honours board. 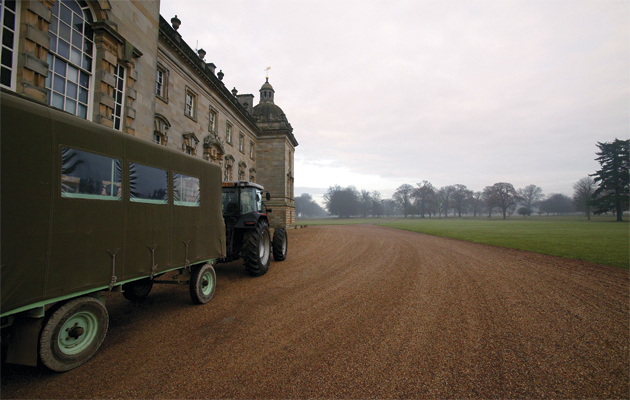 A Game Fair host, its centrepiece is a lovely house in Capability Brown parkland. Some think it is the greatest pheasant-shooting in the world. “Many drives provide birds that are genuinely unkillable,” says William Duckworth-Chad of Savills. The highest of pheasants in the deepest of Devon valleys over thousands of acres make it difficult to beat, with brown trout, sea-trout and salmon on the Bray. The house is special, too. On the south Cornwall coast, Caerhays has a variety of shooting in spectacular surroundings. The Rookery is the pick of the drives, where the guns get the view down Porthluney Valley, with pheasants flying out of the canvas of the Nash-designed Grade I listed castle, which in the mid 19th century was so derelict geese drank in the drawing-room. The Vean lodge is very plush. If you like estates big, as in 35,000 acres, then Chatsworth is your quarry. You have the pheasant-shoot, a trout stream on the Wye, parkland and stable blocks. It is the heart of the Peak District National Park and most of its lung, too. There is moorland and woodland, with a rare collection of ancient oaks. Chatsworth House, across the Derwent, puts the stately into home and has a few spare rooms for sporting guests. “Brought up fishing the River Itchen, I had to choose perhaps the greatest estate on the Test or the Itchen – Compton Manor. A fine house, thousands of acres of good partridge- and pheasant-shooting, but, most importantly, one of the premier beats on unquestionably the premier chalkstream in the world,” says Mark McAndrew of Strutt & Parker. The lovely house sits in a park and the estate runs one of the finest shoots in the south of England. Wildlife and conser-vation is at its core, with a third of the estate woodland. There are valleys at Conholt where no machine has been allowed to venture. The guns move around on foot and the game cart is pulled by a horse, with damson gin in the saddlebag. An estate with magic in the mahonias. “Can somewhere so remote still exist in this day and age? It is so quiet you can hear yourself think,” says Anna Thomas of Savills. The lodge is a thoroughly modern castle with views over the loch. More than 50,000 acres to play in. Go stalking on the hill and get distracted by golden eagles, or try some trout fishing. This is sporting estate meets natural wilderness. It also produces its own venison. A fly-fisherman’s dream and one for the purist – and that’s before you take the whisky trail and pay homage to the glens of Fiddich and Livet. The lodge sits on the banks of the Spey and you get to catch an Atlantic salmon on the finest fly water. An unbeatable and challenging beat on a top performing Scottish river. There is also high- and lowground shooting. A Buccleuch estate with pheasants and partridges, salmon on the Nith, trout in the lochs, driven grouse, roe- and wild-goat stalking and a castle. “I grew up at Drumlanrig, shooting pigeon, ferreting, sea-trout fishing at night, beating on the smart days. Then I had my first chance at driven grouse and pheasants. Part of my shooting soul will always be there,” says Jonathan Kennedy of CKD Kennedy Macpherson. Ownership passed from the Singhs – 846 partridges shot before lunch on a September day in 1895 – to a brewing dynasty. Curry and Guinness – sounds like a night out after the rugby. The idea for a Guinness Book of Records came from a shooting party in Ireland in 1951 when guns argued about the relative speeds of golden plover and grouse. Fine shooting and lavish parties. Is there a toucan in the gamebook? Desirable? You want to take it to bed. A Georgian house of great beauty, 2,000 acres on the Isle of Purbeck and an outstanding pheasant shoot – this is high-bird heaven on sea. The golden bowl of 1,000 acres at the heart of the estate is a stunning landscape and the first glimpse of the house as you turn into the drive jaw-dropping. Fish from the rocks, be you keen fisherman or inquisitive child. Does not usually get this good so close to the capital. This is renowned and testing pheasant- and partridge-shooing on a very well run estate. The rolling valleys provide for roe- and fallow-stalking. A beautiful house is concealed behind a high wall. “If you want to be close to London but feel hidden away in unspoilt countryside, this is the place,” says Toby Milbank of Knight Frank. “Whether you are following hounds over the Downs or swinging through a fast covey of partridges, the Firle estate has it all,” says David Steel of Smiths Gore: 3,500 acres of stunning South Downs countryside and a house of Tudor origins with Georgian tweaks. Try the local beer, Harveys, dating back to 1790. I start drinking it around 1800. A 10,000-acre estate with a large lake in a lovely landscape. 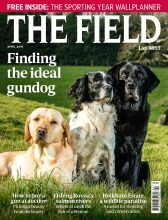 “Fonthill has special valleys, fabulous for deerstalking, pheasants and partridges,” said Ed Sugden of Savills Country Department. Plenty of woodland, as well as farmland and gardens. The main house, built in the Sixties, is a far subtler creation than the old abbey, a neo-Gothic shocker, which eventually collapsed – hoist with its own façade. Partridge- and pheasant-shooting in the Yorkshire premier league – deep, wide valleys and hanging woods are the top-ography of top sport on this 13,500-acre estate. Even the hall started life as a shooting box. Garrowby Hill is the highest point on the Yorkshire Wolds. If you swing an invitation here make sure you know your nags, for this is racing country. Actually, if you swing an invitation, you’re incredibly lucky. Glenfeshie is 45,000 acres of the Cairngorms, a landscape of vast natural wares, including ancient Caledonian pine forest. Grouse, salmon and red deer are all here, under an hour from Inverness. If you want remote grandeur and your own private kingdom, trek here. This is wild beauty married to great sport. Take your painting oils as well as gun oil. Glenfeshie was the backdrop to Landseer’s Monarch of the Glen. If grouse-shooting were an Olympic sport this would be the venue for 2012. Half-marathons have been run in the time some drives last on this trophy estate of more than 30,000 acres. It has been described as a Highland estate in England. The shooting is exhilarating across a breadth of moors and the lowground shooting is worth texting home about – if you can get reception. A mighty fine lodge, too. 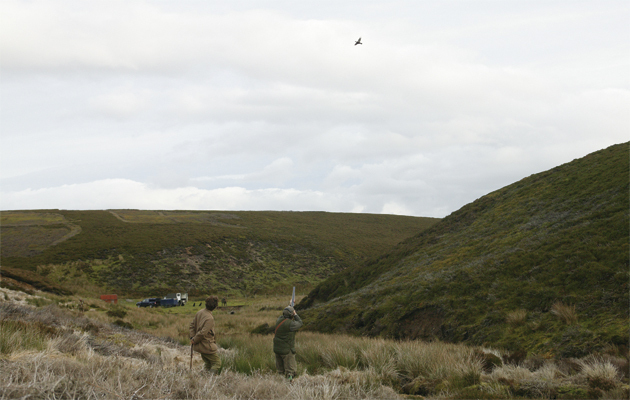 Another prized Yorkshire pheasant-shooting invitation, the deep, sheer valleys challenge the finest shots. Besides the pheasant-shoot there is a grouse moor, which can produce at least a day’s driving and an island moor giving an excellent “walked-up” day. Arden Hall dates back to the 17th century and has lovely gardens. This estate has demonstrated award-winning excellence in woodland management. A wild-bird shoot and the pride of Norfolk across 25,000 acres. Wildfowling to die for and excellent driven game-shooting, with the keepers resplendent in bowler hats. A Palladian hall and a range of brick-and-flint cottages and Georgian farmhouses make up a considerable portfolio. The estate’s beach is a National Nature Reserve, and Lord Nelson had both eyes open when he explored this stretch of coast. An historic Palladian mansion, grand parkland and a restored five-acre walled garden, Houghton also has its own private army. Well, a remarkable toy soldier collection any-way. Plenty of wild grey partridges on its rolling acres – challenging birds and a noble tradition. There is stalking, too. Houghton Hall was built in the 1720s by Sir Robert Walpole, Britain’s first prime minister and the 4,000-acre estate is the seat of the Marquess of Cholmondeley. Sport as varied as the landscapes and as numerous as the distilleries. 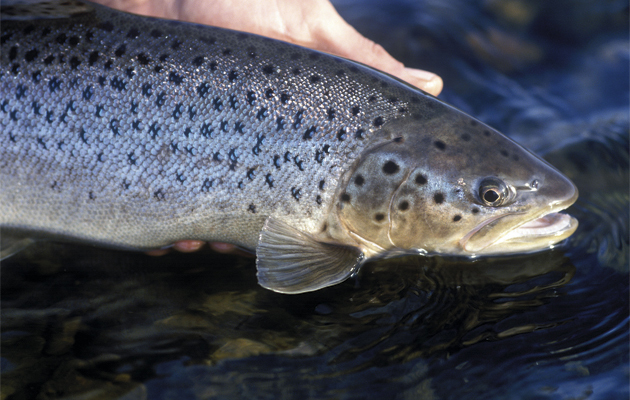 Brown and sea-trout fishing in the lochs, as well as salmon and sea-fishing and stalking. “Islay stags average over 18 stone and have heads like Christmas trees. There is the occasional grouse to give pointers a purpose and the chance of a Macnab. But the wildfowl and woodcock is the real secret of Islay,” says Robert McCulloch of Strutt & Parker. This is a topside of rare Welsh sporting beef in the Ceiriog valley. Neck braces are worn here not after a tough afternoon in a rugby scrum, but after straining to see the highest pheasants. Go on, pronounce and spell the drives. Head for the West Arms, shooting hospitality at is finest, and you can taste that topside of beef. Llanarmon is run by Bobby McAlpine, an excellent shot, who knows his wine. Tidy. Lush. A mere 35,000 acres of breathtaking Highlands wilderness, largely made up of two deer forests either side of a three-mile loch. The lodge sits at the head of Loch Choire. The Mallet flows into the loch. Salmon and trout and fine red deer-stalking, with some grouse and ptarmigan on the top. “The scale is staggering. And the fact that all the sport is wild, makes it a very special place,” says Jon Lambert of John Clegg & Co.
Park, woodland, farm and a stunning Grade I listed late-17th century house. I know a chap who owns The Swan, but chatelaine Charlotte Townshend is allowed to own swans which puts her on a list of, er, two, alongside HM The Queen. Lady Charlotte is married to James Townshend, chief executive of Velcourt, the farming company. 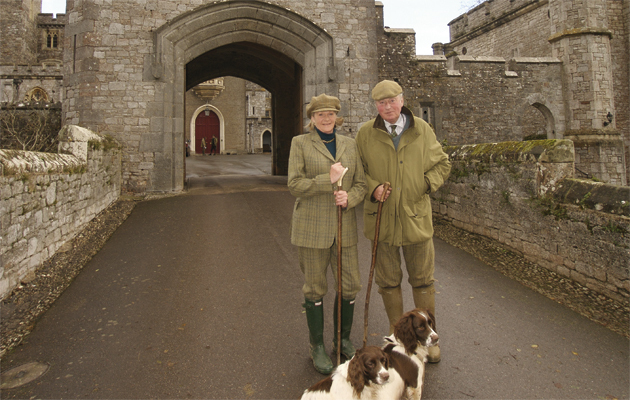 The couple are de-voted to fieldsports. Both hunting and shooting thrive here. Languid stretches of Tweed to fish, with high cliffs and deep pools. The house, overlooking the river, has been lovingly restored; I am told by an insider that the entrance hall is 16ft high, so no need to take down your 15ft salmon rod. The river acts as a sublime backdrop to the pheasant- and partridge-shooting. There is excellent roe-stalking, too. “As a grouse moor Millden stands supreme… Better-broken dogs were never seen on a moor,” wrote top Edwardian shot AE Gathorne-Hardy. It continues to inspire awe. In the heart of Glen Esk, it has eight days’ grouse-driving, 10 miles of double-bank salmon fishing on the North Esk and a great pheasant- and partridge-shoot. The sport is based round a refurbished lodge, overlooking the river. Sportsmen who meet a genie ask for three things: a great grouse moor to call their own, to be hailed as a great shot and to be a wizard fly fisherman. The fourth would be personal wealth. Meet Jeremy Herrmann, master of Muggleswick and, indeed, East Allenheads, who rubbed the right bottle. Herrmann even called a hedge fund after a predatory trout. Envious? Good lord, no. I think he just turned 40. One for the romantics , tucked away in the hidden valleys of south-west Devon. This was a labour of love, started in 1994 by Andrew and Darcie Baylis. They restored the 17th- century manor house, revived a shoot dormant since the 1880s and cleared choked river-banks. “Shooting high birds amid ancient hardwoods and salmon fishing on the Lynher is any man’s dream of a perfect world,” according to Crispin Holborow of Savills. If you leave Burgundy, as the family did in the 12th century, it has to be for somewhere special. Powderham Castle remains the seat of the Earl of Devon and what a 3,500-acre armchair it is. The pheasants and partridges are high and fast, the gin sloe, as was Timothy the tortoise which lived to 160. The architecture of the 14th-century castle is as rich as its tales. A cracking mixed shoot over a 10,000-acre estate. With several excellent lakes and marshes, there is fine duck-shooting: morning and evening flights to top and tail any day. To wildfowlers’ heaven add snipe and driven, migratory woodcock. Presaddfed Hall is a 17th-century manor house, set in woodland. There is fly-fishing on the lake for brown trout. A Durham all-rounder to rival Sir Ian Botham, who has surely fired a few shots in these parts, from bat and gun. 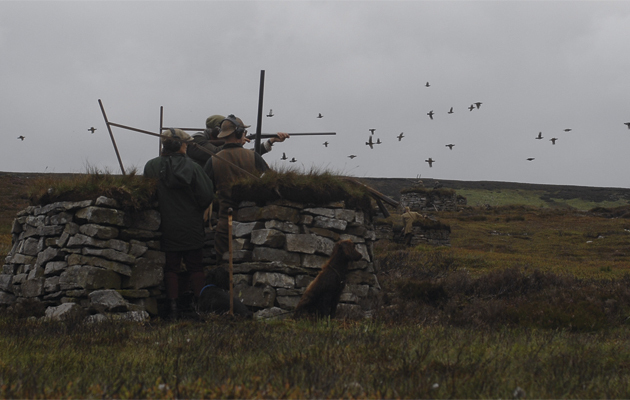 Driven grouse, pheasants, grey partridges, woodcock and snipe – take your pick, for this is mixed sport in stirring landscapes. There is also roe-stalking – just don’t cull them from the turrets of the magnificent 14th-century castle. The Raby estates straddle Teesdale, Co Durham and Northumberland. More than 54,000 acres, including pheasant-shooting amid mixed woodland and two grouse moors. The pheasant guns have lunch in the state dining-room; the grouse guns in a hut on the moor. There is salmon and sea-trout fishing on Tweed and, if you have any energy left, a stud farm. Floors Castle, complete with fairy-tale turrets, sits on a natural terrace surveying Tweed. Difficult to find flaws on this estate. Wild pheasants, stunning grey partridges and wildfowling, all with a Royal pedigree – formal days in the company of kings, queens and smartly dressed keepers. “Rabbiting with an army of keepers strengthened one’s resolve to shoot straighter, as the insults flew.  Ferreting the hedgerows, tickling the trout and being one of the guns for the annual field trial defines the breadth of the sport available,” said Charles Loyd of Strutt & Parker. A 5,500-acre estate in the Cotswolds, known for both pheasants and partridges, with the acres a mix of woodland, grassland and arable on the banks of the Coln. Stone walls and deep valleys stud the estate. Stowell Park has been owned by the Vestey family since 1921 and in the Second World War was an American hospital, where pioneering surgery took place to remove shrapnel and bullets. A beautiful, 2,500-acre shooting estate set in a bowl of chalk downland straight out of Hardy. The shoot has been deliberately toned down commercially and is all the better for it. Change is organically driven: the farm animals are rare and well bred and a shop sells meat, eggs and honey. Owner Alastair Cooper is a rare breed, too – a former investment banker to be applauded. A 2,000-acre estate deep in the Marlborough Downs. “I live near Marlborough and love its countryside and landscape. Temple is a fantastic sporting estate because it provides ex-ceptional mixed partridge- and pheasant-shooting in a beautiful setting,” says Mark Lawson of The Buying Solution. Rolling hill and valley, strategically placed woodland and cover crops add to the sporting table. The house is relatively new and there is a collection of estate properties, too. It is a love at first sight house for architectural aesthetes and has barely changed its outward appearance since its 18th-century beginnings. Then there are the gorgeous gardens, with Trewithen, which means house of trees, internationally renowned for its magnolias and camellias. For sport, there is the pheasant-shoot and all sorts of wildfowl, as well as snipe, woodcock and partridges, to keep Cornish shots keen. Under Michael Stone, Weardale has developed into one of the top moors in the country, with grouse and pheasants in good numbers. And to think a few years ago you could not find a North Pennines bird to illustrate a whisky bottle. The house is beautifully positioned in a bowl at the top of Weardale and well equipped for a shooting team. Only the hardiest of sheep apply for upland grazing rights. “You have to be totally mad to own a grouse moor. It makes no sense at all. But I would not swap it for anything,” says Michael Cannon of his Wemmergill estate. This is 17,000 acres of possibly the world’s finest grouse moor, with Cannon spending millions, made mainly from beer, restoring the moorland so successfully. Guns dream of standing in the Shipka Pass, waiting for the feathered red Indians. On the Berkshire/Hampshire borders in lovely downland with hidden valleys and high, very high, pheasants, thanks to the ideal topography. There is partridge country, too. Only 75 minutes from central London – when agents had fast cars – but those who love this estate, Russians and Arabs mainly, prefer to land a chopper on the front lawn (the house is Georgian and gorgeous.). Clay days take over in summer. Plenty of bang for your Bucks estate here. A lovely stately home and grounds and some very good pheasant-shooting. This is 5,000 acres in the Chiltern Hills, with the house a cracking example of early 18th-century Palladian architecture. Shoot in the morning then scramble over the valley to watch Wasps play rugby. If you can wipe the owner’s eye you are doing well – he’s Sir Edward Dashwood. The estate’s shooting records date back to 1825. “Lord Forester values quality over quantity and enjoys the company of those who, when presented with two birds will go for the more challenging,” says Lydia Forester of Carter Jonas. She should know; she married him. Lord Forester is supposedly one of the few men allowed to wear a hat in the presence of the monarch. Hats off to the Salopian splendours of Willey Park.